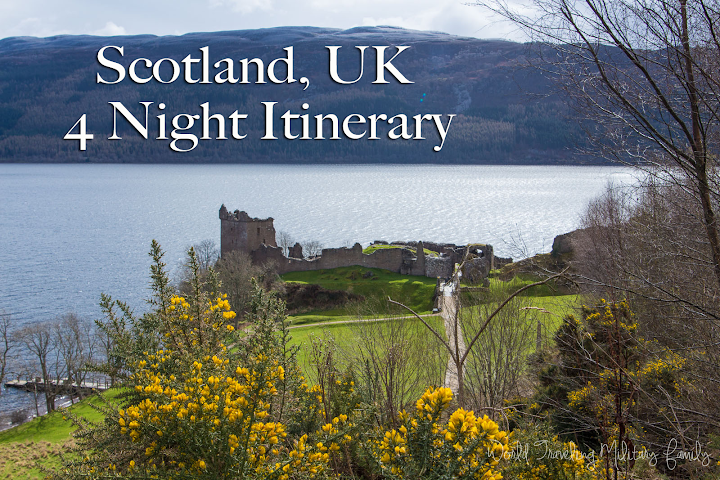 Scotland, UK 4 Night Itinerary With Costs! 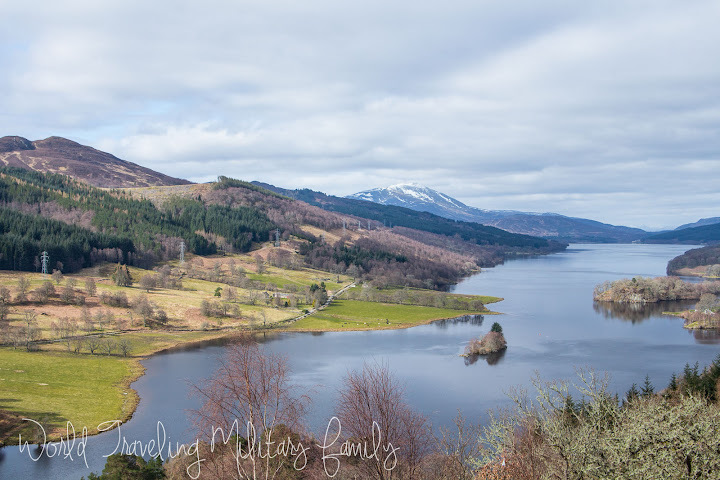 I’m excited to share our Scotland, UK 4 Night itinerary, we went in mid April during Spring Break and loved it! I think it SHOULD be on your bucket list! The Highlands are amazing and not to be missed. You’ll find castles, amazing scenery, distilleries, & more! Our trip was done in 5 days and 4 nights but you could easily spend a week in the area if you have time. Lots of ‘off the beaten path’ travel opportunities in this country! I can easily say that our trip to the Normandy region has been one of the highlights during our time here. We flew out of Dusseldorf-Weeze and it was a great experience. This is a great smaller airport with lots of parking so you don’t have to worry about reserving ahead. You can park in P3 for €45 or a little closer in P2 for €50. We chose Dusseldorf-Weeze for a few reasons. It’s a bit further away at 2.5 hours drive from Spang but the tickets were a bit cheaper, although the main draw was the flight times! If we flew out of Frankfurt Hahn we would’ve had to leave at 10 pm and arrive in Edinburgh at 11 pm, so pretty much a waste of a day. Instead by going out of DW we were able to leave at 12:15 pm and arrive in Edinburgh at 1 pm (they are an hour ahead of Germany). That way we still had half a day to explore Edinburgh instead of wasting a day. Also on the return flight instead of getting in super early we were able to get in at 4 pm and then drive home. We went during our Spring Break (April 12-16), this is a great time to go as it’s before the peak season hits and there were not many tourists or crowds at the places we went. The British pound is expensive so we kept food costs lower by stopping at grocery stores and getting stuff to make sandwiches, fruit, etc for lunch each day. Breakfast was included with all our B&B’s so we only big food cost was to eat out for dinner each night. One of the BEST things I did was purchase the 3-4 day itinerary from Secret Scotland for £11.99! Using this guide we were able stay off the main roads and avoid the tourists, we got see things that most don’t know about or miss. It was so worth the money! You do still have to do a bit of work to decide which sights your going to stop at from their impressive list but that was not bad at all. There is also information about raining day attractions & local places to eat. Below is our itinerary with a short blurb including costs and the link to the post on each place which has more detailed info as well, these will be added as I get them done over the next few weeks. Arrive in Edinburgh at 1 pm local time, pick up rental car – post about this HERE, we had a great experience! Linner at The Filling Station – American style food which was a treat after living in Germany for over 2 years! Elephant Café – took pic outside, JK Rowling wrote Harry potter there. 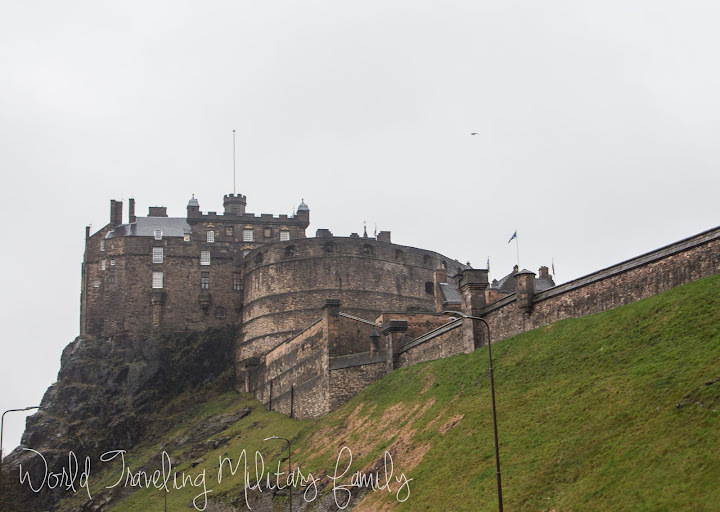 Edinburgh Castle – went up to to top for pics, chose not to go inside after researching reviews. Mary’s Milk Bar – Homemade gelato, unique flavors, cash only. Bannockburn Visitor Center (Indoors) – Cost involved but we didn’t stay, stopped here but would’ve had to wait 45 mins for next tour & I didn’t want to waste that much time so we moved on. Stirling Castle – Free, Just went to see the outside and take pics. Great views from the cemetery behind the church. Scottish Wool Center – Free, try to stop by at 11 am, 1 pm, or 3 pm to see the sheep dog demos. Doune Castle – £17.60, Toured this castle, it’s where Outlander, Game of Thrones (winter fell) & more were filmed. Audioguide included with price, only took about 30 mins to tour. 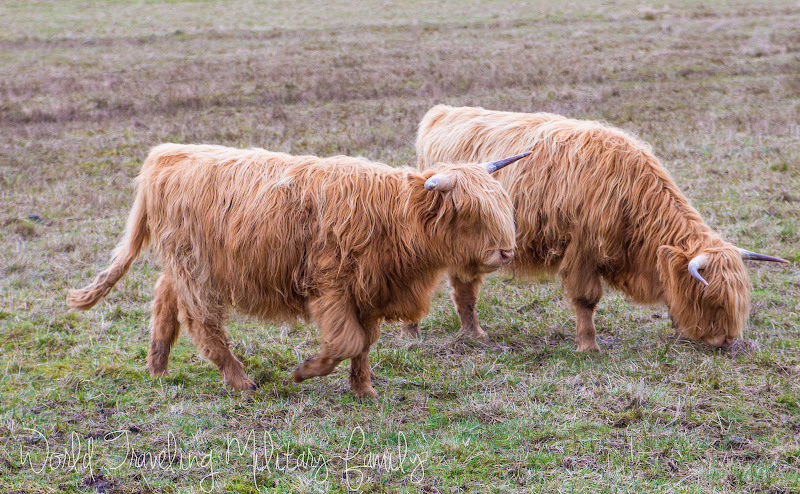 Duke’s Pass – Free, great scenic road and we were able to see the Highland cows here up close! Falls of Dochart – Free, quick stop to see the falls and visit the cute gift shop near it. 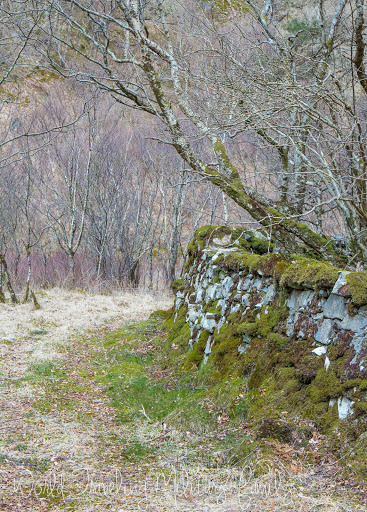 Finlarig Castle ruins – Free, stopped to walk through the ruins. Croftmoraig Stone Circle – Free, you can’t get up close to it but you can see it from the road. Total attraction cost for 2 adults & 2 kids (12 & 15) £17.60/$26. Food cost for day £131/$189. Queen view – Free, great overview of the area, looked amazing with the snowcapped mountains! Killiecrankie Pass – Free, got to practice the soldiers leap and take a quick hike down to the river. Also free hands on learning exhibits there. Blair Castle – £28 fam, one of the best castles we’ve visited! Got to see & listen to a bag pipe player as well. Dalwhinne Distillery – £30, highest operating one in Scotland, tour & tasted the whiskey. Falls of Truim – Free, neat little falls and you can climb on rocks in the river. Can see salmon in season as well. Ruthven Barracks – Free, impressive ruins for photos, short visit to walk through. Culloden Battlefield To Visitor Centre – Family £26, neat place to learn about the history of Scotland and the infamous battle on the fields. Loch Ness Exhibition – Family £22.50, neat way to learn about the history and what has been done researching Nessie. Urguhart Castle – Free, car park photo only, didn’t pay to tour. Used the Secret Scotland Route modified from Skye area to drive back towards the B&B. 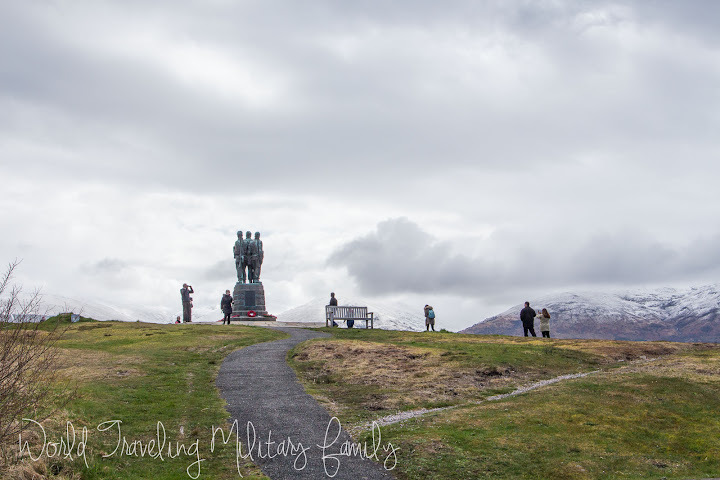 Commando Memorial – Free, stopped for amazing views & photos of the memorial. Loch Leven Seafood Cafe – spendy but if your a shellfish fan this may be your hidden gem. Green Welly Stop Cafe – Free, free bathrooms, gift shops, & food! Edinample castle – Free, nice photo op along this hidden road. Total attraction cost for 2 adults & 2 kids (12 & 15) £22.50/$32. Food cost for day £147.25/$213. Left B&B at 10 am to drive 1 hour to Edinburgh Airport. Total attraction cost for 2 adults & 2 kids (12 & 15) £0. Food cost for day £20 & €20/$52. I hope you get the chance to experience the Scotland, the Highlands were my favorite area, I’m sure you won’t be disappointed! *Note there are affiliate links in this post. Hi! you talked about a post on your car rental experience. Can you tell me about that? We are planning our trip to Scotland in Sept and would like some information. Thanks! Yes, I posted about it here http://www.worldtravelingmilitaryfamily.com/renting-a-car-in-scotland-uk/ Hope you have a great trip!